Deric's MindBlog: Top-down and Bottom-up causation in the emergence of complexity. Top-down and Bottom-up causation in the emergence of complexity. I want to pass on just the first section of a commentary by George F.R. Ellis on a paper by Aharonov et al., whose evidence and analysis support a top–down structure in quantum mechanics according to which higher-order correlations can always determine lower-order ones, but not vice versa. Ellis puts this in the context of top-down versus bottom-up causation in the emergence of complexity at higher levels of organization. The nature of emergence of complexity out of the underlying physics is a key issue in understanding the world around us. 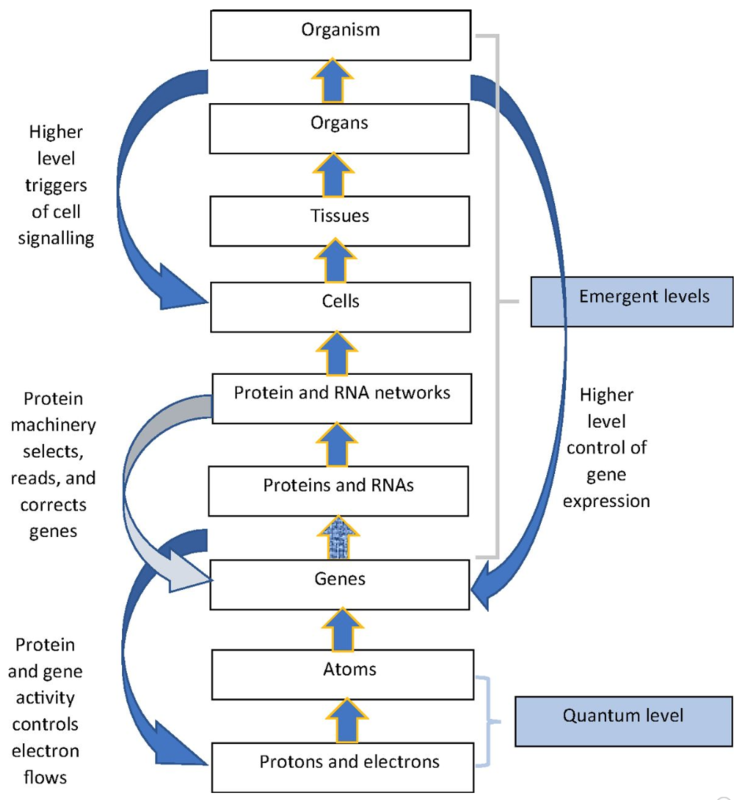 Genuine emergence can be claimed to depend on top-down causation, which enables higher emergent levels to direct the outcomes of causation at lower levels to fulfill higher-level causal requirements; for example, the needs of heart physiology at the systems level determine gene expression at the cellular level via gene regulatory networks (see Figure, click to enlarge). However, the idea of top-down causation has been denied by a number of commentators. The paper by Aharonov et al. makes a strong contribution to this debate by giving quantum physics examples where top-down causation manifestly occurs. This physics result has strong implications for the philosophical debate about whether strong emergence is possible. Indeed, it gives specific examples where it occurs in a remarkably strong form. Now, the word “causation” is regarded with suspicion by many philosophers of science, so to characterize what is happening one can perhaps rather use a number of different descriptions such as “whole–part constraint” or “top-down realization.” The key point remains the same, that higher levels can influence lower-level outcomes in many ways, and hence explain how strong emergence is possible. This occurs across science in general, and in physics in particular. The latter point is key because of the alleged causal completeness of physics, which supposition underlies supervenience arguments against strong emergence and the supposed possibility of overdetermination of lower-level outcomes. However, if top-down action occurs in physics in general, and in quantum physics — the bottom level of the hierarchy of emergence (See Figure) — in particular, such claims are undermined.